A physical sign of stroke sequel on the skeleton of Leonardo da Vinci? From UFR of Health Sciences (UVSQ & EA 4569 Paris-Descartes) (P.C., S.D. ), Montigny-Le-Bretonneux; and CASH & IPES (P.C. ), Nanterre, France. Scholars generally state that Leonardo da Vinci died in 1519 at age 67 of recurrent stroke. 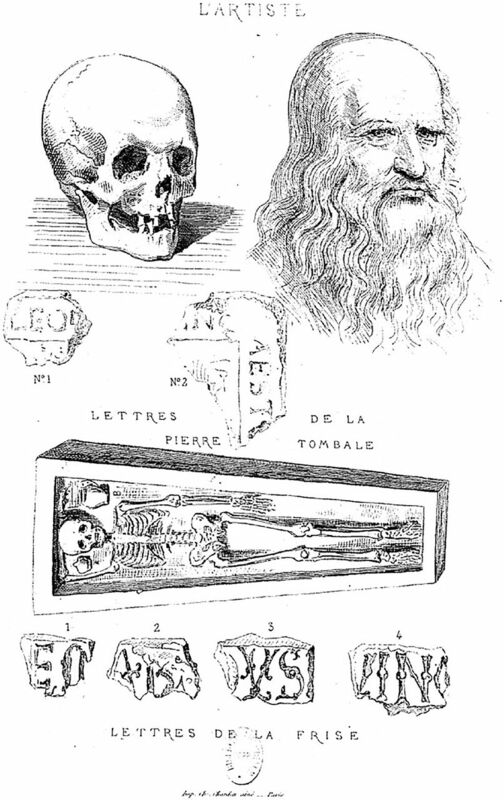 One finding may confirm this medical hypothesis: in 1863, the grave of Leonardo was discovered in the Saint-Florentin chapel of Amboise (France), with the skeleton of an old man, tiny fragments of white hair, 8 remaining teeth, and the upper right arm blocked over the skull1 (figure). Engraving from L'Artiste (Paris), March 1, 1864, from a drawing by Frans Verhas. The main explication for this atypical position is the presence of a local or regional handicap. Stroke is a possible cause of such anomaly, causing muscular retraction or shoulder dislocation (whose reduction may be difficult or impossible, even postmortem).2 A direct examination of the skeleton could complete this anthropologic analysis. Author contributions: Dr. Charlier: study supervision, main writing process, analysis and interpretation. S. Deo: critical revision of the manuscript for important intellectual content.
. La tombe de Léonard à Amboise. In: Charlier P, ed. Actes du 3ème Colloque International de Pathographie. Paris: De Boccard; 2009.
. Management of the hemiplegic shoulder complex. Top Stroke Rehabil 2014;21:316–318.